Skoda's killed off the Yeti, and returned with an altogether different beast. Quiet and punchy around town, while offering superb comfort and refinement at a competitive price. Watch out class leaders. 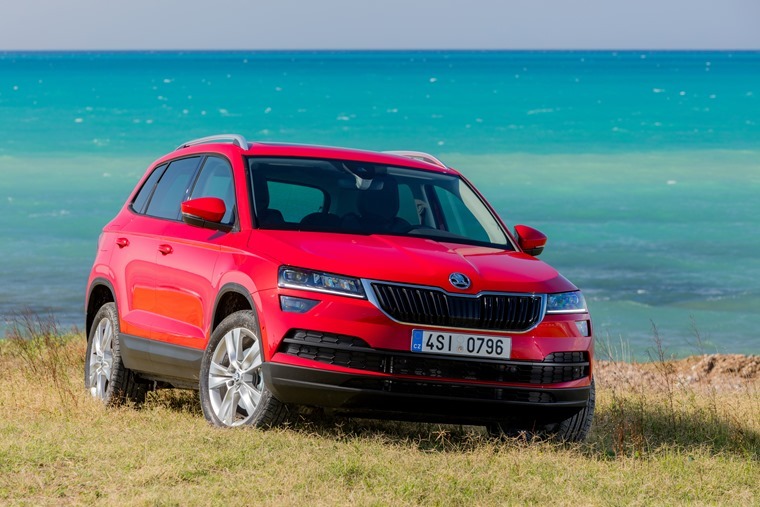 Skoda broke the mould when it created the Yeti, which goes a long way to explaining why the Karoq is an altogether different car in looks, feel and style. Yet, it tackles the small SUV sector with the same vigour and vim as the car it replaces and should see the Czech company grow its sales in this class. Gone are the love ’em or loath ’em looks of the Yeti in favour of a more generic Skoda design language. As well as the ‘K’ name, the Karoq also shares plenty of styling cues with its Kodiaq big brother, which is no bad thing. It’s just it’s less distinctive than the Yeti and, for some of us, that’s a bit of a shame. Never mind, what lies underneath the Karoq is all good. Quiet and punchy around town, it also offers nippy acceleration on country roads while also cruising along multi-lane routes in hushed tones. It’s based on the Volkswagen Group’s MQB platform that comes from the wellspring of the Golf and gives life to the likes of the Tiguan and Seat Ateca. No surprises, then, the Karoq uses the 1.0- and 1.5-litre TSI turbo petrol engines and 1.6- and 2.0-litre turbodiesels already seen in these models. While the 1.0-litre with 115hp offers the cheapest way into a Karoq, along with 54.3mpg and 118g/km carbon dioxide emissions if you go for the DSG twin-clutch automatic gearbox, it’s not the most rounded. Around town, the 1.0-litre is smooth and refined, but you have to work it harder than it sometimes feels happy to on the motorway. It doesn’t become rowdy, more that it just lacks a bit of oomph for overtaking and truly relaxed long-distance work. Still, both manual and automatic gearboxes are slick. Nowhere is the real-world ability of the Karoq more evident than its cushy ride. There’s a touch of firmness at low speeds, but this is more about sound body control in corners. A much better option, and the pick of the range, is the 1.5-litre turbo petrol with its 150hp. It can see off 0-62mph in 8.1 seconds with the manual gearbox, or 8.3 when coupled to the DSG auto, so it’s no slouch. It can also return up to 52.3mpg and 123g/km in manual form, so running costs are on a par with the 2.0-litre turbodiesel version. In every condition, the 1.5 petrol acquits itself with aplomb. Quiet and punchy around town, it also offers nippy acceleration on country roads while also cruising along multi-lane routes in hushed tones. All credit to Skoda ... it's much better suited to the tasks it’s likely to deal with, rather than some marketing team’s idealised vision of drivers with a ‘lifestyle’. Nowhere is the real-world ability of the Karoq more evident than its cushy ride. There’s a touch of firmness at low speeds, but this is more about sound body control in corners. As the pace increases, the Skoda just keeps on absorbing bumps with a skill and deftness no other in this class gets close to. For this alone, it has to be on your list of contenders. Choosing a diesel doesn’t undermine the refinement of the Karoq or spoil the ride. The 1.6-litre TDI returns up to 64.2mpg and as little as 117g/km of CO2 when fitted with the DSG transmission. 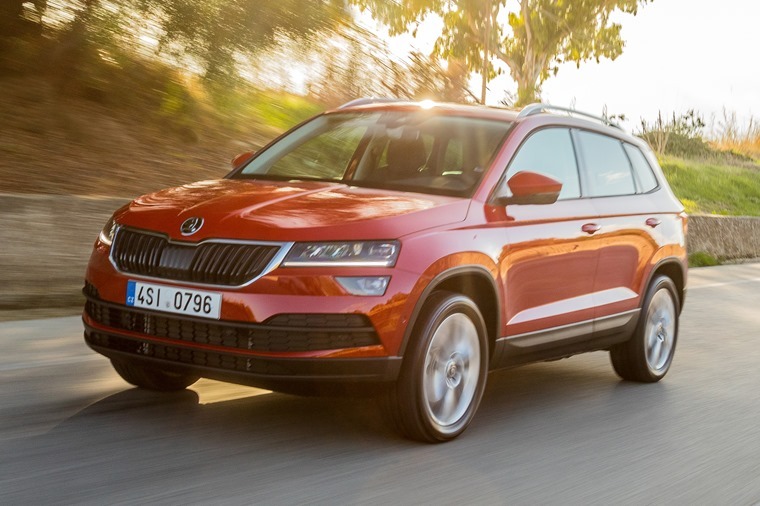 This is the better bet of the two diesels as the 2.0-litre is the only Karoq offered with four-wheel drive and that impacts on economy and emissions, taking them to bests of 56.5mpg and 131g/km. While the all-wheel drive adds grip in slippery conditions and comes as standard with Off-Road and Snow modes, the truth is few will ever need this. Even so, it’s a good steer and keeps noise to a minimum at all speeds. All of this makes the Skoda very competitive on spec and price when compared with its direct rivals. While you’re sat in the Karoq, you’ll also notice it offers more space for heads, legs, shoulders and luggage than the Yeti it replaces. You can further extend its versatility if you opt for the SE L or Edition models that come with Varioflex seating as standard. This is a refinement of the Yeti’s system where you remove the individual centre chair and slide the outer seats in by 80mm. 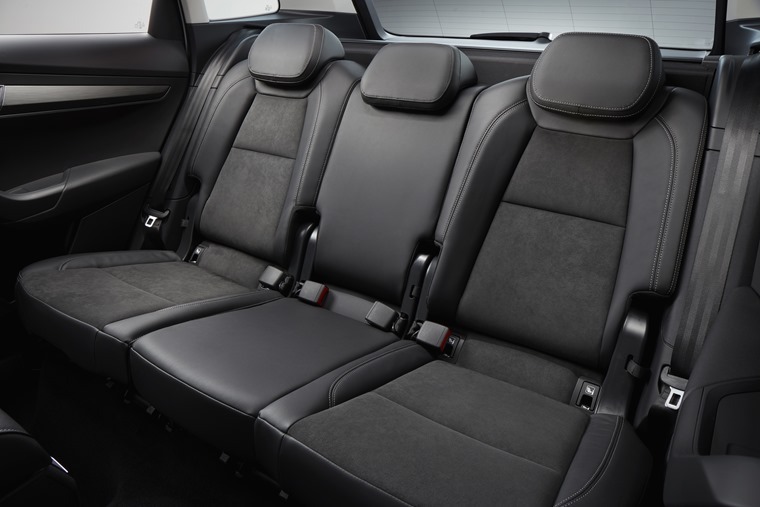 The result is a remarkably spacious and comfy four-seat family car. In normal mode, the boot offers a generous 521-litres of space or, with the rear seats all tumbled forward, a maximum of 1630-litres. There’s also a boot net system as standard to secure loads. Factor in the Karoq’s superb comfort and refinement and it simply has to be one of the cars you consider in this class. The SE trim does without Varioflex as standard, but it does come with 17-inch alloy wheels, automatic headlights, cruise control and automatic emergency braking. There’s also climate control, Smartlink to hook up your phone to the car, rear parking sensors and a long list of safety kit including seven airbags and Pedestrian Monitor. Move up to the SE L and you gain 18-inch alloy wheels, Alcantara upholstery, satellite navigation and keyless entry and starting. This model also comes with all-round parking sensors, rear view camera and those Varioflex seats. Topping out the line-up is the Edition version which enjoys 19-inch alloys, Columbus sat-nav with 9.2-inch touchscreen, and electrically adjusted, heated front seats. The infotainment gets gesture control, while you also enjoy a panoramic sunroof, leather upholstery and Lane Assist. 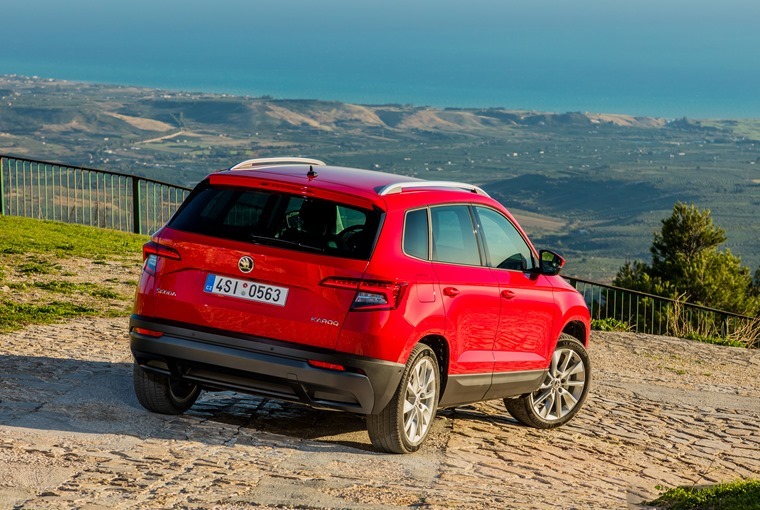 All of this makes the Skoda very competitive on spec and price when compared with its direct rivals, such as the Nissan Qashqai and aforementioned Ateca. 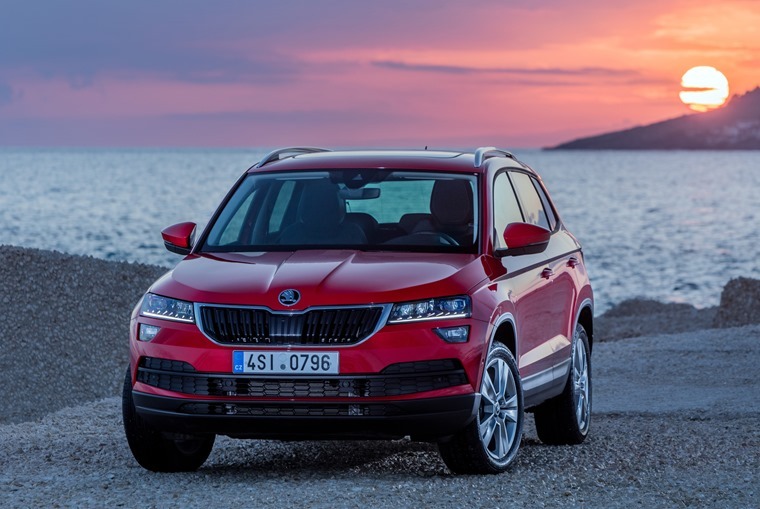 Skoda may have moved the Karoq more into the centre ground of the small SUV sector than the Yeti, but it’s lost none of the previous model’s competitive approach.